SAGITA COM - sagitasoft.com - CyberLink baru ini menambahkan satu produk terbarunya yaitu CyberLink PhotoDirector 4 Ultra Multilingual, ini untuk melengkapi beberapa software yang saat ini telah beredar, PhotoDirector akan sangat berguna bagi Anda para fotografer untuk mendapatkan kinerja yang luar biasa dan hasil berkualitas tinggi. Penggunaannya pun sangat mudah dan hasilnya pun sangat bagus walaupun seorang amatir sekalipun. Import and organize all your photos in the library for easy browsing and editing. View each individual photo’s metadata information. Add and embed keyword tags and copyright information in photos. Crop and rotate photos, or apply touch-ups such as red-eye and spot removal. 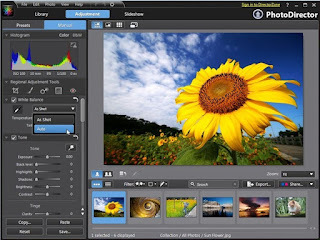 Modify photo color and white balance with easy to use adjustment controls. Sharpen photos and correct photos that contain unwanted vignetting or image noise. Create dazzling photo slideshows and output them as video files. Share photos on Facebook and Flickr, and upload created photo slideshows directly to YouTube. Select the Best Image Every time.